Shiritori (しりとり) is a Japanese word game in which the players must say a word that begins with the final kana of the previous word (see description on Wikipedia). 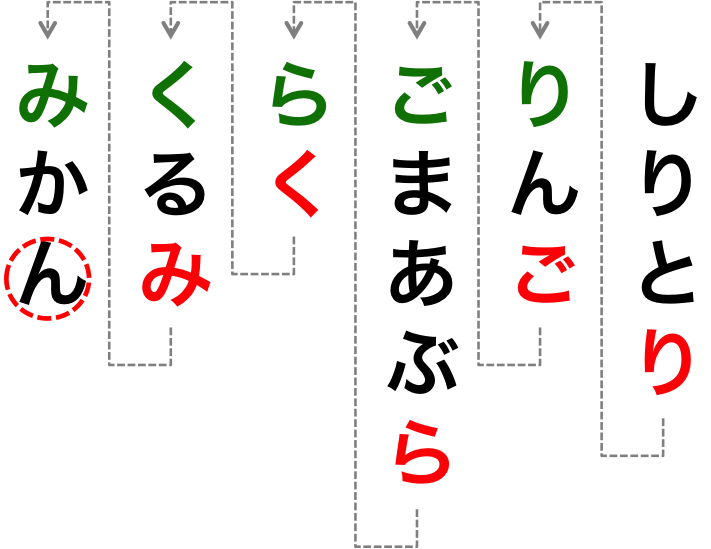 This proposed implementation of this educative game, which requires some minimum knowledge of the Japanese language, provides a fun way to enhance your Japanese level and produces some personalized data that allow you to follow your progresses. It should foster the learning of new words. Furthermore, when you lose, the system checks whether or not you knew some suitable words, and show you the list if any (to achieve this, the system remembers all the words you have used so far). Freely available online at www.shiritori.org. The following table summarises the results of our tests (in August 2013). All other browsers that are not mentioned might very well be compatible. We have conducted some tests using the Android Emulator, and the application appeared to be fully compatible (we did not observed any anomalies during the simulations). This application is developed in Java using GWT. It currently runs on Google App Engine. The dictionary is implemented using the file system. The users’ data are stored using the schemaless NoSQL Google datastore built on top of Bigtable. This application relies on material from the JMdict (EDICT, etc.) dictionary files in accordance with the licence provisions of the Electronic Dictionaries Research Group. See www.csse.monash.edu.au/~jwb/ and www.edrdg.org/.